You might have selected good business ideas for your upcoming startup company. You might be ready with resources and money required to make this startup company successful. However executing those ideas in a correct manner is a difficult task. 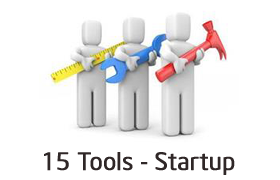 In order to help you in fulfilling your business dream here is 15 Tools & Apps for your startup company. Trello is very useful task manager for your startup company. This free tool offers a facility to manage the task in an organized manner. You need not maintain lengthy email, spreadsheets and sticky notes for your project you can use Trello which provide flexible and visual way to organize everything. A business version of this tool gives additional administrative controls and security. OneNote is a popular tool from Microsoft. OneNote can give multiple benefits to your startup. You can work in organize manner using OneNote. It allows you to take notes on the fly. You can record minutes of meeting using OneNote. You can add any file, email, and tag information in this tool. I highly recommend usage of this tool for a startup company. Bidsketch is proposal software which allows you to create professional client proposals in minutes. You can customize these proposals as per your requirement. You can even electronically sign these proposals. It is a paid product but if your startup company is involved in writing lot of proposals to clients I recommend to have a look at Bidsketch. It is obvious that you require good manpower to run your startup company. Recuruiterbox is a software that helps you to carry out recruitment process easily. You can track and manage job applications. You can customize your recruitment process by this tool. You can even organize and share a review about candidate using this tool. It will also help you to do resume management. Zoho Invoice generator is a free online tool that will help you to generate your invoice quickly. This tool gives a various editable fields. You just need to input data and your Invoice is ready. You can print the invoice or save it for reference. It is fastest and easiest method to generate the invoice. During a startup process of your business, you may need to store and keep a lot of documents. If you want to exchange information with other you can use DropBox. DropBox gives you a free facility to store your data. Communication is a key of success for any business. Lync is unified communication tool by Microsoft. This tool provides facility to have voice calling, Instant Messaging, online meeting, file sharing, desktop sharing and lot more. Although it is paid tool it is recommended tool for your startup. Slack is a free communication tool for effective collaboration. This is a similar tool like Lync it allows you to do group conversation, file sharing and content search. Slack is free to use for as long as you want and with an unlimited number of people. Paid version of Slack includes guest access, searchable archive etc. Flyp app allows you assign six phone numbers on your smartphone. This number remains simultaneously live on your smartphone. You can have dedicated number for every activity. Each number has own SMS, voicemail and profile facility. Basecamp is online project management and collaboration tool. This tool gives essential workspace to a team for day to day operations. Basecamp is cloud base platform which gives task list, discussion platform, documents and calendar for project management. One can integrate basecamp with other desktop and web-based applications. Wrike is online Project management tool for your startup company. Wrike combines project management with real-time workspace for collaboration, discussion and document sharing. You can set a goal, define priority and track project using this tool. This tool helps you to improve your planning and accountability. Invision is design, prototyping, collaboration and workflow tool. You can transform static designs into clickable prototype using this tool. You can present and share design using this tool. You can even gather feedback on the design. It is a best project management tool for web designers. Product Hunt is a tool to share and discover new products for your startup company. You can find detail about competitor products on this site. You can also share your product on this website and increase your revenue. Product Hunt is a free tool. Quickbooks help your startup company to organize your finances at one place. You can do invoicing, bookkeeping, billing, expense tracking and sales using this tool. This tool works across all devices. (iPad, iPhone, android). It helps business owners to make informed decision. You can avail 30 days free trial of this tool before purchasing. Intercom is customer communication platform. Intercom helps you to have a live conversation with the customer. You can send targeted message to website visitor and users of your app. Intercom gives you free trail pack for 14 days. The observe package of this tool is free for ever. You must try this tool for your business. Hope you find above tools useful and interesting. Please help us in growing this list by adding too that you use for your startup company. Do share your experience of using various tools & apps. We are using slack for video meetings but I think intercom.io is worth a try and for collaboration with remote teams we are using proofhub and I’m loving it. Almost everything we need on single platform. Check it out!